Besides the obvious, there are a couple of other reasons to root for the two new network doctor shows debuting this fall. The obvious is that any program enlisting in the cause of the Hippocratic oath against the Damaged Health Care greedheads is on the side of the angels. What Presidio Med has going for it is a cast that would be worth watching at a hip-hop performance of Maimonides’ Guide for the Perplexed – Blythe Danner, Dana Delany, and Anna Deavere Smith, not to mention Sasha Alexander and Julianne Nicholson, as a San Francisco collective of physicians (mainly female) who deliver preemies, transplant hearts, cut up lungs, and bob noses whether or not their patients have medical insurance. (Delany, to get away from her journalist husband, even does volunteer work in a refugee camp in Pakistan.) 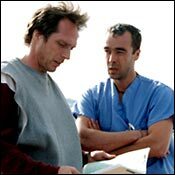 Whereas MDs, also set in San Francisco, brings back the keep-’em-in-stitches spirit of M*A*S*H, with William Fichtner and John Hannah as subversive surgeons who, with the help of a flabbergasted Michaela Conlin as a first-year intern, resort to the hospital morgue for a surprise biopsy when cost-cutting administrators won’t authorize an operating room. It ought to be clear by now that the best medical care in the country is available only on television.